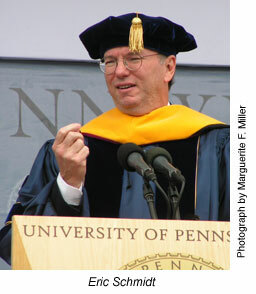 Penn Commencement Address by Dr. Eric E. Schmidt, chairman of the Board, CEO, Google, Inc., Monday, May 18, 2009. Thank you for that. Let me begin by congratulating all the graduates. It’s exciting to be graduating and I especially want to congratulate the parents. And remember that they still need you and maybe they’ll now listen to you. And if you aren’t sure who I’m talking to, I’m actually talking to both the parents and the students, so congratulations to everybody. We owe a debt in my industry—to Penn—that is profound. It was in 1946 that the ENIAC was invented, right here in a basement down the street. And literally everything that you see, every computer, every mobile phone, every device, descends from the principles that were invented right here. This really is the center of my world. And now 63 years later, 250 of your alumni work at Google. This is the most desirable place for us to hire interns anywhere in the world and I can tell you that we know the quality of the graduates that I see before me are the best in the world. It is exciting to be part of this. Now, when I think about Penn, I think about the metaphor of resilience, of a culture that works, of a hunger to change. If you think about 20 years ago, when Penn was struggling and the changes that the people around me made to turn it into the most desirable undergraduate major from a standpoint of high school applications in the country, from the kind of culture that has been built here, you see that the culture works, and that the combination that you see represented on the stage, that the parents are so proud to have sent their students to really has delivered, the very best that we can do here in America. And of course, we also have the best cheesesteaks in the world, which is not so bad. When I look at this group, I see the Google and Facebook generation. And when I was first in this stadium, my track buddies and I got in a sta tion wagon—you remember them—and I drove up here to go to a track and field event with the great Marty Liquori. And I think this is almost 40 years ago. We had Tang, you have Red Bull. Now, we programmed computers in a language called BASIC. You, of course, use Java. We had VCRs that had an hour of video and cost $700. You use YouTube and you upload 15 hours of YouTube video every minute. And we got our news from newspapers. Remember them? You get news from blogs and tweets. And for those of you who don’t know what a tweet is, it’s not what you hear in a zoo. We stood in line to buy Pong, you stood in line to buy the Wii. We didn’t tell people about our most embarrassing moments in college, you record them and post them on YouTube and Facebook every day. And I am looking forward to watching these for the next 30 or 40 years. We used mainframe computers with 300 megabytes of storage to go to the moon 6 times. You use an iPod with 120 gigabytes, that’s about 500 times more, to get to your next class. Which is not that close, because it’s an urban campus. We thought that “friending” was a noun. You think of it as a verb. We had phone booths, remember them? You have cell phones. We wore watches; we took pictures with cameras. We navigated with maps; we listened to transistor radios. Again, you have a cell phone. We thought that the marvels of computers and technology would help us improve the world. You agree, and we’re both right. So despite all these marvels, this a great time to be graduating. Now, you went to college to develop the kind of analytical thinking skills to deal with enormous amounts of complex information that you’ll face for the rest of your life. But I would argue you have in many ways the best opportunity before you because you’re graduating into a tough time. I used my favorite search engine of course to find out “What did the Great Depression spur?” Well, it spurred Rice Krispies, Twinkies and the beer can. You would have never gotten through college without these things, right? So it seems to me that with all the technology and connected-ness that we see, you have an opportunity that’s even better, even stronger than anything that I ever faced when I was sitting in the same seats. You are seeing a situation where due to the enormous goodwill of people—here on the stage and others—we have an opportunity to have everyone in the world have access to all the world’s information. This has never been possible. And why is this so important? Why is ubiquitous information so profound? It’s a tremendous equalizer. Information is power, people have fought over it, people care a lot about it, it serves as a check and balance on politicians. If you were a dictator, which of course you’re not going to be, because you’re a fine graduate from Penn, first thing you would do is shut off all the communication so that people couldn’t actually talk each other and figure out how to make the world a better place. Information is very, very important. And, in fact, the way you should invade these oppressive regimes is through information. Then the citizens will take that information and turn their societies into better societies. This is going to continue and to continue and to continue. And what are we going to do with this vastly more popular web? Well we’re building a contemporaneous and historical record that is unparalleled in human history. There are all sorts of interesting possibilities. You’ll have megabits of bandwidth to essentially every human pair of hands in the world. For knowledge, for entertainment, for all of the things that people care about. You could have a face-to-face meeting across the world. And with automatic translation, you can talk to them even though they don’t speak your language. When you’re traveling in Mongolia, those of you who are graduating and want to take a week off, go to Mongolia and you fall off your motorcycle, you can get medical care from a doctor that doesn’t speak your language because your medical records can be right there. This is life changing, life saving, life fundamental. Imagine a situation, happening very soon, where all of the world’s information will be translated into all the other languages, so we can find out what everybody really thinks. And we can develop a new insight into what they care about and they can with us. In the next ten years, it will be possible to have the equivalent of iPods in your purse or on your belt with 85 years of video. Which means that if it’s given to you at birth, you’re going to be frustrated the whole time, you’ll never be done watching all the videos. That’s how profound this technological revolution is. You could ask Google the most important questions, like, where are my car keys after all? Because all of a sudden we’ll know where everything is and we can make that available. Computers are good at some things, and they are particularly good at these sorts of things. We can detect flu outbreaks, because we can watch what people are doing quicker. We can do things; here’s another example. What I really want is while I’m typing a paper I want the computer to tell me what I should have been writing instead. Wouldn’t that have been useful? Another product that we’ve suggested but its not been built yet is the paper lengthening project. It adds ten percent to every paper and its recursive. It would have been very useful. The point is that computers really can help you, even though you don’t need this anymore now that you are out of college. So if you think of mobile phones as a metaphor, as an extension of you, with image recognition, avatars and all the technologies that are coming. You can see that the ability for us to make our lives even more powerful is all right before us. Graduation gives you the courage to be unreasonable. Don’t bother to have a plan. Instead let’s have some luck. Success is really about being ready for the good opportunities that come before you. It’s not to have a detailed plan about everything you’re going to do, you can’t plan innovation or inspiration, but you can be ready for it. And when you see it, you can jump on it and you can make a difference, as many of the people here today have already done. The important point here is, if you forego your plan you also then have to forego fear. In many ways in the last four years and maybe in high school as well, you’ve been penalized for making mistakes. From now on, the rewards will gravitate to those who make mistakes and learn from them, as the president said. So stop right now. Take a minute and think of something completely new and go work on that. Take that as your challenge; take that as your opportunity. Whatever you care the most about. So how should you do it, how should you behave? Well, do it in a group, its much more fun anyway. None of us is as smart as all of us. Universities now are good at teaching you how to work with other people, its no longer the lone light sitting in the lab, it’s a team. And you can see Twitter as an example of a form of social intelligence; use it. Find a network of people that care about you and so forth and so on. You can imagine watching Watson and Crick, who discovered the structure of DNA, did it at a university. You can imagine today, there are two people who probably met on Facebook at a university. And then are going to say to each other, “what are you up to right now?” “Oh, I’m finding the secret of life, then I’m off to a pub. LOL.” It’s okay. Do it together. But amidst all of this, some truths emerge. Leadership and personality matter a lot. Intelligence, education, and analytical reasoning matter. Trust matters. In the network world, trust is the most important currency. Which brings me to my final question. What is, in fact, the meaning of life? And in a world where everything is remembered and everything is kept forever—the world you are in—you need to live for the future and the things that you really, really care about. And what are those things? Well in order to know that, I hate to say it, but you’re going to have to turn off your computer. You’re actually going to have to turn off your phone and discover all that is human around us. You’ll find that people really are the same all around the world. They really do care about the same things. You’ll find that curiosity and enthusiasm and passion are contagious. I see it with the students, I see it with the faculty, I see it with the trustees and the president here—it’s contagious. Make it happen, take it with you. You’ll find that nothing beats holding the hand of your grandchild as he walks his first steps. You’ll find that a mind set in its ways is a life wasted—don’t do it. You’ll find that the resilience of a human being and the human spirit is amazing. You’ll find today that the best chance you will ever have is right now, to start being unreasonable. But when you do, listen to me, be nice to your parents and true to your school. Good luck, and thank you very much. Thank you.